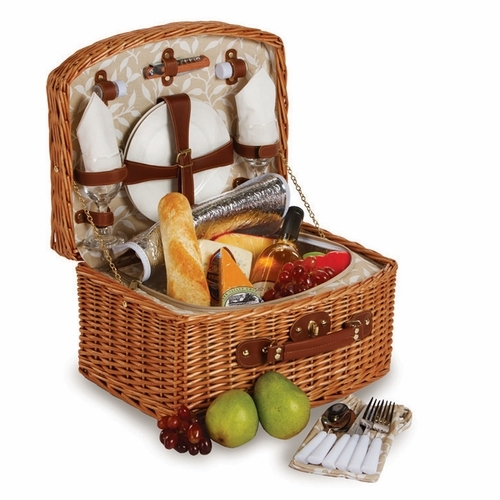 This handcrafted honey Willow Benton picnic basket from Picnic Plus comes with a set of two ceramic plates, stainless steel flatware, glass drink ware, cotton napkins, wooden handle waiters corkscrew tool and salt/pepper shakers. With the full size thermal foil insulated built in cooler section, you can take-a-long plenty of food, wine, snacks and beverages for a romantic outing, picnic, summer concert, stroll in the park, afternoon at the beach, or evening dinner under the stars. Easy to transport by the padded carry handles. Designed in the USA, this basket also makes a beautiful bridal or wedding gift. Thank you for contacting me regarding my order. Very good customer service! I can not thank you enough for the impeccable level of customer service and satisfaction you and your company have provided! I got my shoes a day early and I felt like a princess!! You eliminated my stress and my order was more than what I expected with you even checking if I placed a double order!! If only more companies and employees took the pride you do!! I can't thank you enough for expediting my package so I could be the bell of the ball , head to toe! The capes arrived yesterday and they are adorable! Thank you for the beautiful floor mats. I received them today and am very happy. I will highly recommend your company. I want to thank you for your prompt attention to this matter, the package was delivered to me yesterday evening. The details on the mats were outstanding, again thank you. I got the monogrammed travel mugs and they look great, thank you so much! Thank you so much. I received my shoes yesterday and I'm bowled over by how cute and comfortable they are. What a pleasure doing business with customer service, too. Wait until my sister gets a look at these. I'll be back for more shoe tops soon! Thank you, Dana, you are a joy to do business with! Thank you, really, really, really!! MATS arrived and they look Great! Thank you! Thank you so much. We will shop your company again very soon! There were several thing that we saw that we will be ordering! How wonderful! I am so impressed with all of you. I am so appreciative for your help. I RECEIVED MY ONESOLE ORDER YESTERDAY. I REALLY AM IMPRESSED WITH ALL OF THE SHOE TOPPERS. I WASN'T EXACTLY SURE WHAT THEY WOULD LOOK LIKE IN PERSON. I CAN SAY THEY EXCEEDED MY EXPECTATION. I AM PLEASED WITH THE ENTIRE TRANSACTION AND LOOK FOR TO ORDERING FROM YOU AGAIN. Thank you so much for all the help. This has definitely been the best service I have ever received and I really appreciate it. Thanks so much. Great customer service isn't something you see to much of in this day and age. I will certainly shop with you again! Today I got my floor mats. They are so nice thank you. You did a good job on them I do appreciate it. Thank you for your quick response. I love my shoes! Your customer service is awesome!! I wanted to thank you for the excellent customer service on my order from June. After I placed the order (I did not read the information about shipping time for monogrammed orders), I realized that the blanket would not be shipped in time for the wedding shower I was attending. I called to see if the order could be rushed. I spoke to someone very pleasant who said she would try to get it processed quickly. Indeed it was shipped very quickly and I had it in time to give to the bride to be. Thank you very much. Thank you for the wine bag! It got here last Friday as you promised. The gift was a success. So much that I want to order another one. Thanks! I just wanted to thank you for all of your help with my choices for my 2 cutting boards. They were a huge hit and turned out perfectly. Thanks again and Happy New Year! Thank you so much for rushing my Lapper. I received it this past Friday as promised. Your Customer Service is unbelievable, I was very impressed at the promptness you replied to my original request but even more impressed with the updates I received throughout this process. Because of the personal and friendly assistance I received I will continue to make purchases through Anderson Avenue and will also tell my friends. Merry Christmas to each and every person at Anderson Avenue and Happy New Year. Y'all are the best!! Thank you Anderson Avenue ~ great Customer Service!! Thank you so much for getting my order completed and delivered on time. They look great and I am sure they are going to make a terrific Christmas gift:) Thank you again!!! Merry Christmas. I sincerely appreciate your help with my order and the great customer service. I will look forward to doing business with you in the future! Thank you so much! We will have one happy 16 year old when she gets them (personalize car mats) in her new car!!!! Thank you so much! Dear Anderson Avenue, thank you so much for the update! I had resigned myself to the fact that it would be at least another week or so before I received my new mats according to your email below which was fine and then much to my surprise, they arrived today...they are TOO CUTE!! I appreciate you taking the time to put my mind at ease and for delivering such nice merchandise! Thank you we Loved the flag it is very nice. Will be looking for Christmas. Thank you. I love your PERFECT customer service and I look forward to receiving the mat---and doing more business with you in the future. What a very fine company you are! I was a little nervous about placing such a sizeable purchase on-line, but my experience with Anderson Avenue and Dana was so positive that I plan to be a repeat customer. Thanks again - I'll think of you when I'm rocking away this summer! I would like you Supervisor's name whether I receive the set Thursday or Friday, to let him/her know how wonderful you've been. I wish you sold more than bedding and furniture, you should be selling houses too as I'd use your services and know that you would take care of me....the company you work for should really know how far you go the extra mile for your customers!!! Ordered a personalized rocking chair. It was high quality with easy and minimal assembly. It arrived days before expected delivery date. Had to call customer service to inquire about an issue and they were most courteous and helpful. All in all... this is an excellent company to work with. I want you to know how much I am enjoying the Michael Amini bedding I purchased from you. To say it is stunning is an understatement. The workmanship on the pillows and comforters are of high quality. I particularly like that the bed skirt is 21 long and comes in 3 pieces. I will be replacing all of the bedding in our house with Michael Amini as I can afford to do so. While the actual delivery of the products hit some snags, your customer service department hung in there and were responsive to my emails and phone calls. Thank you for offering such a fabulous product at such a reasonable price. Rated Price a '4' - A little more than I wanted to spend. Rated Shipping a '4' - Price okay. Just no other options. Other than that, it was a perfect shopping experience. I even called Customer Service to ask about changing the fabric - after I placed the order. They were very helpful and understanding. Shipment was very fast. The Sleepover Sofa is beautiful. Thank you very much! Body: I have ordered several items from this company - their customer service is the best I have seen in a very long time, I did all my pre- wedding buying and Christmas shopping on line - I will be a customer to shop here for a very long time and will pass on the site to my friends and family. Just wanted to let you know that I received both the bedspreads today and they are just absolutely beautiful and I have them on the beds, they are just beautiful so thanks so much and I really appreciate them. The look and quality of the tray are great. Copyright 2019 Anderson Avenue. All Rights Reserved.